The researchers showed that the neurons in the visual cortex (in the vicinity of the Fusiform Face Area) responded much more strongly to faces than to city landscapes or objects (see examples: https://youtu.be/QYJCB60FhHE). 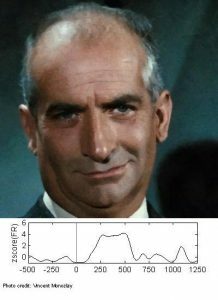 A high response was found both for faces of famous people (e.g., Charles Aznavour, Nicolas Sarkozy, Catherine Deneuve, Louis De Funes) and for faces unfamiliar to the participant in the experiment. In an additional experiment, the neurons exhibited face-selectivity to human and animal faces that appeared within a movie (a clip from Charlie Chaplin’s The Circus). Probably the best-known neurons that respond to faces have been the so-called “Jennifer Aniston cells” ? the neurons in the medial temporal lobe that respond to different images of a specific person (e.g., Jennifer Aniston in the original study published in Nature by Quiroga and colleagues in 2005). The present results provide unique insights into human brain functioning at the cellular level during face processing. These findings also help bridge the understanding of face mechanisms across species (i.e., monkeys and humans). Vadim Axelrod, Camille Rozier, Tal Seidel Malkinson, Katia Lehongre, Claude Adam, Virginie Lambrecq, Vincent Navarro, Lionel Naccache. January 22, 2019; 92 (4). Neurology.